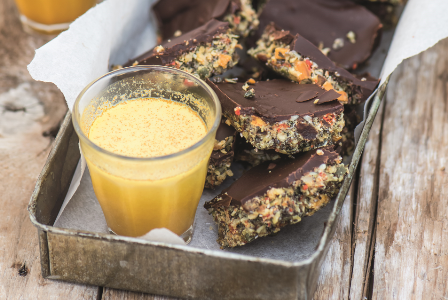 This tasty recipe is one of the many delicious sweet ideas you will find in The Happy Pear's new cookbook, Recipes for Happiness. Bursting with flavours, full of nutrients, this vegan treat is perfect for the lunchbox or as a healthy snack! "These crunchy, chewy, superfood-packed, colourful flapjacks are a real indulgence. We first created them with our friend Simon in London, and they quickly became a treat in Steve’s house with the little pears! It is worth getting cocoa butter, as it will result in a firmer flapjack, but if not, coconut oil will work fine." 1. Finely chop the dried apricots and mango into small pieces to make it easier on your food processor. Put them into the processor with the pumpkin seeds, coconut, chia seeds, walnuts, dates, goji berries and vanilla extract, and pulse until the nuts and seeds are well chopped and broken up but there is still some texture to them. Pour the blended mixture into a large bowl. 2. Melt the cocoa butter in a bowl over simmering water, the same as you would melt chocolate. Once melted, pour it over the nut and seed mixture and mix well. 3. Line a flapjack tray with baking parchment and spread the mixture evenly so that it is about 3cm thick. Using the back of a spoon, smooth the top level. 4. Now melt the chocolate in the bowl over simmering water and spread over the nut and seed mixture. 5. Put into the fridge and leave for 20 minutes to set. Once cooled, chop into 4 x 4 pieces, to make 16 flapjack bars. Store in an airtight tin for up to a week. 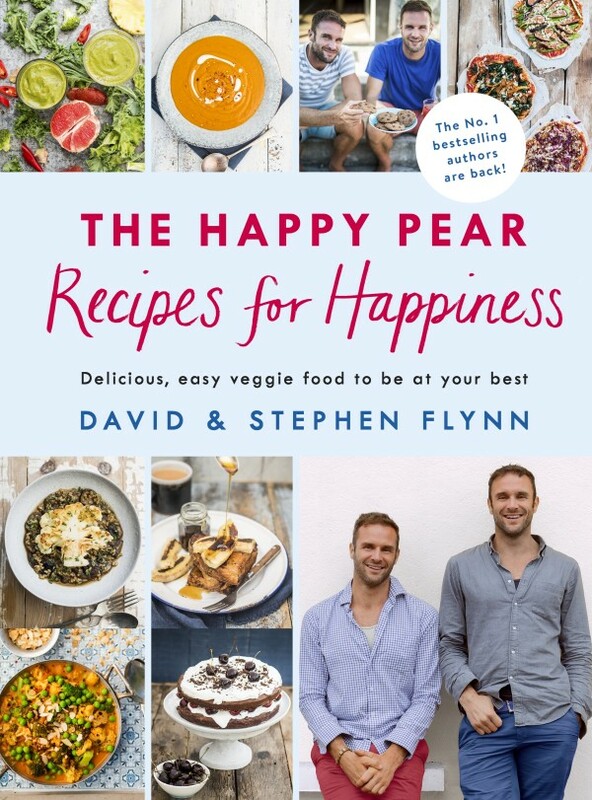 After two best sellers, The Happy Pear twins are back with a new book, packed with affordable, quick and easy veggie options, clever meat-free versions of popular favourites and inspiring advice on how to be healthier! Though they have written two #1 bestselling vegetarian cookbooks, David and Stephen Flynn know it can be challenging to juggle everything and still feel inspired! And being busy dads themselves, they also know the pressure of getting delicious healthy meals on the table every day. That's why Recipes for Happiness is very close to their hearts. And it does what it says on the cover: it is crammed with recipes to make you happier, including a huge section of economical easy dinners that can be rustled up in 15 minutes (Thai golden curry, one-pot creamy mushroom pasta); gorgeous hearty dishes (goulash, Greek summer stew, an ingenious one-pot lasagne that's cooked on the hob); a selection of plant-based alternatives to family favourites (burgers, hotdogs, cheatin' nuggets, kebabs), and irresistible treats (summer fruit Bakewell tart, double choc brownie cake).